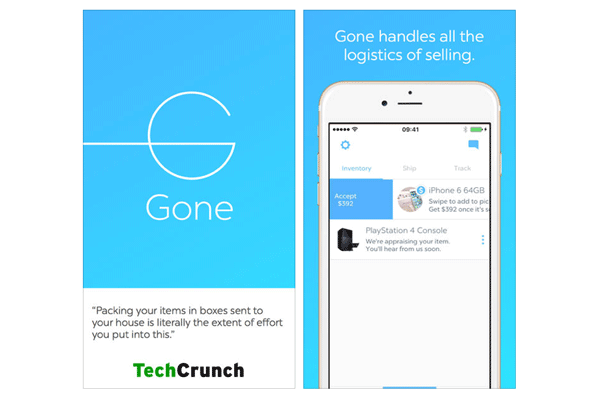 Try these easy-to-use apps to make some quick cash or buy a secondhand item on the cheap. Letgo has a great app. From the bicycle your kid grew out of to the cool leather jacket you bought on a whim but only wore a few times, are you looking to get rid of some of the clutter in your home? If the answer is yes, why not make some cash from these items with a few simple clicks on your smartphone? Following the belief that one man's trash is another man's treasure, there are several popular, user-friendly apps available right now that make selling secondhand items a breeze. "There's nothing easier than using an app to snap a photo of an item and uploading it immediately to the marketplace," says Kendal Perez, blogger for HassleFreeSavings.com and savings expert for CouponSherpa.com. People looking for a great deal can also use these apps to buy secondhand items in good condition for a significant discount off of the retail price. Some items may even be unused with the tags still on, which often happens when people receive gifts they donit need and decide to resell them. Ready to learn more? Here's the rundown on five of the best apps for buying and selling used stuff that you should download today. 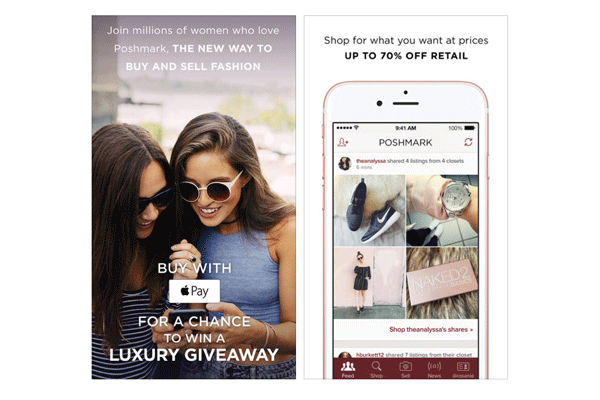 Women's clothing and accessories are the main focus of Poshmark, though you can also buy and sell fashion items for men and kids, too. Users who sign up create a virtual "closet" where they can display items they'd like to sell. In order to create a listing, simply use your phone to snap a photo of the item you want to sell (you can add up to four photos), filter it with one of the app's photo filters, write a short description about the product, and answer a few questions (such as size, color, brand, original price and listing price). When you make a sale on Poshmark, you're provided with a pre-paid, pre-addressed shipping label. Once your sale has been packaged, you can drop it off at a USPS mailbox or schedule a free pickup with USPS.com. You can receive money from your sales via direct deposit to your bank account or request a check. Users looking to buy items on Poshmark can search for specific items, or browse the listings of other "Poshers" they've chosen to follow. Items are sold for up to 70% off the retail price and include designers such as J. Crew, Coach, Michael Kors, Anthropologie and Gucci. You can use your credit card or PayPal to make a purchase, or you can pay for items using any credits you've earned and the redeemable balance from previous sales. 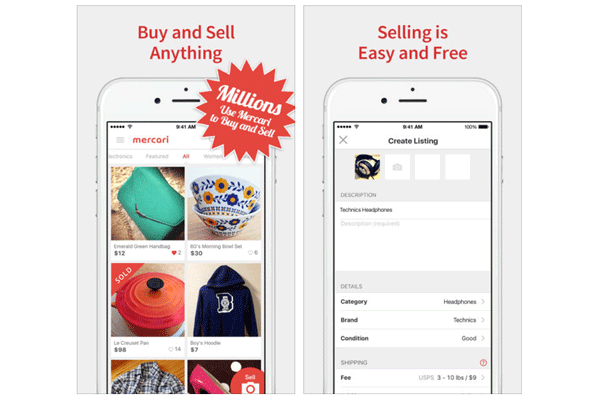 You can think of Mercari as a sort of "flea market app" that allows users to buy and sell a wide variety of new, used and handmade items, from clothing and beauty products†to video games and collectibles. Mercari originated in Japan, where it's become a mobile shopping sensation, and launched its app in the U.S. in 2014. Sellers list items by snapping up to four photos, writing a description and answering some basic questions about the item, including the price, brand and condition. Sellers must also indicate whether or not they†will cover the shipping costs. (Tip: not surprisingly, items often sell faster when sellers agree to pay for shipping.) Mercari will send you a FedEx or USPS shipping label after your item is sold. This app is designed to let users to buy and sell stuff in their local area, including cars, electronics, clothing and accessories, sports memorabilia, movies, books, music, home and garden items and more. 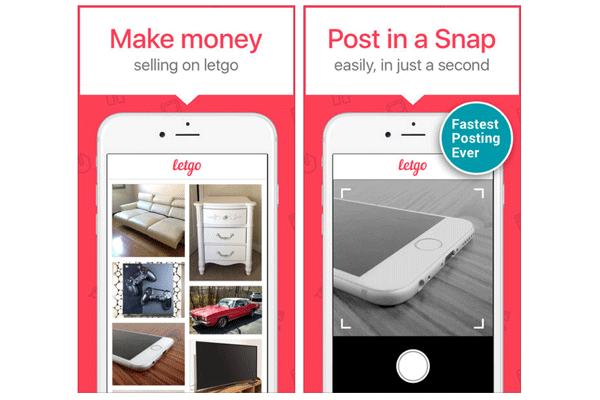 Unlike some other apps for buying and selling used stuff, letgo discourages sellers from shipping items to buyers. Instead, the app encourages users to interact via a private chat feature to arrange an in-person sale. Of course, it's always a good idea to meet in a public place rather than at a person's home and use cash for the transaction. Listings show the approximate location (but not the exact address) of where the item was posted, so buyers can see how far it is from their town. To create a listing, sellers can upload up to five photos of the item, write a description and establish a price. The app also allows you to create a commercial to advertise your listing (sellers simply choose a fun video template and the app does the rest for you). What letgo doesn't do: provide refunds or assist with disputes. The apps says that "the interaction and negotiations between buyers and sellers are the sole responsibility of the parties involved." "This is a great app for buying and selling large household items and pretty much everything else," says Perez. "It's like Craigslist but offers reviews of buyers and sellers." Like letgo, OfferUp does not offer shipping options and instead encourages users to message each other on the app to arrange a sale, then meet up in person to complete the transaction. The approximate locations of where items are being sold are shown so people can browse listings in their local area. 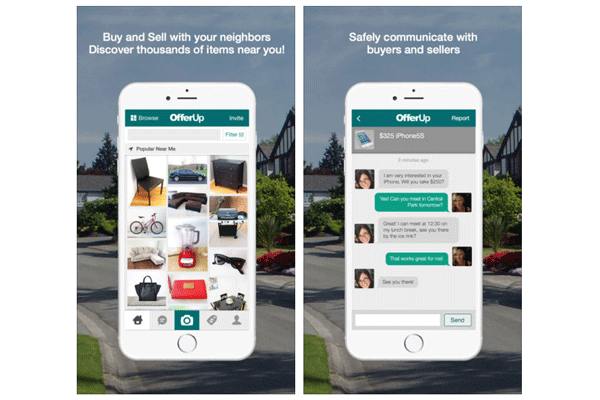 An additional feature of OfferUp is the optional TruYou Program, which allows users to validate their identity to help increase confidence among buyers and sellers. To take part in the program, you must verify your Facebook profile, scan your driver's license (a state-issued I.D. or U.S. passport is also O.K.) and take a selfie. Take a look around your home: do you have any electronics gathering dust that you just don't use anymore? From laptops, phones and tablets to e-readers and smartwatches, Gone can help you get some cash for those items. The best part? The app will do just about all the work for you. Here's how Gone works: snap a picture or record a video of your used electronics, gadgets or small appliances. If Gone determines that an item can be resold, the company will make you an offer. If you accept the offer, Gone will pick up the item from your home or send you prepaid shipping materials and a printed label to drop off at any UPS location. It will also list the item and find a buyer for you, so you can just sit back and relax. As long as your item passes inspection and sells successfully, you'll receive your payment. If your item doesnt sell in 30 days, you'll have the option to lower the price or receive your item back at no cost.